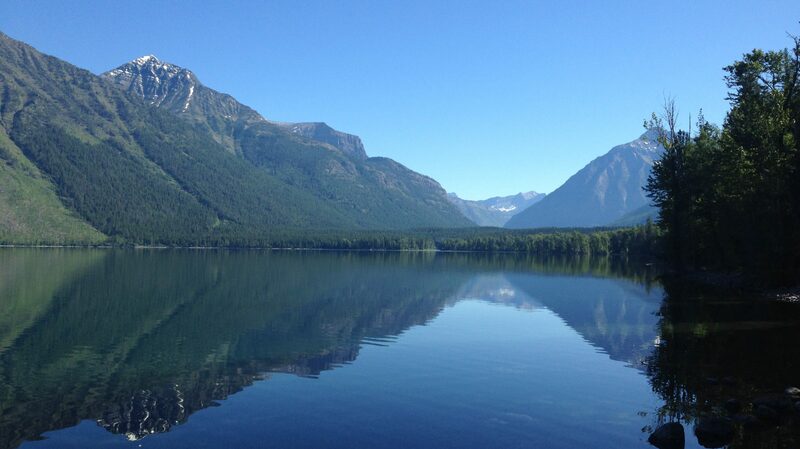 The Gunsight Pass Trail traverses a portion of the park from Lake McDonald Lodge, past the Sperry Chalet, Gunsight Lake and Lake Ellen Wilson to the Jackson Glacier Overlook. Both trailheads can be reached from the Going to the Sun Road. The entire trail is about 20 miles long and most thru hikers do it in 2 days with an overnight stop at one of several backcountry campgrounds or the Sperry Chalet. We aren’t much for backpacking so we decided on a shorter trek starting from the Jackson Glacier Overlook. Both of us entered this hike with a bit of trepidation as it was our first real foray into Grizzly Country. Our goal was to make it to the Florence Falls trail junction (4 miles in, making it a total hike of 8 miles). We had hopes of reaching the falls but wanted to wait to see how we were feeling when we got there. We knew going in that the final mile of the return trip would be a strenuous uphill climb so we planned to reserve some energy for that (and it was good we did). This is a pleasant trail, a cooler option on that 85-degree day. It is fairly evenly graded with some beautiful views and was the least crowded trail we experienced in late June (we saw several groups of hikers though none of the “lines” we encountered on a few other trails). The section we chose was the least strenuous portion of the route–it runs along the valley floor as opposed to climbing the peaks as it does in other segments. This stretch of the trail is mostly forested though it occasionally brings you to a break in the foliage overlooking a marshy area (look for moose!) with incredible views of the soaring mountain peaks and Jackson Glacier as the backdrop. Upon completing the initial steep decent the trail levels off at the lovely Deadwood Falls. This is a good place for a break on the return trip before attempting the final climb to the top. There’s plenty of space to sit on the rocks in the sun or shade (depending on your preference and the time of day) and let the mist from the falling water cool you. The creek below the falls is also an opportunity to dip your feet in the chilly water; just use caution, the current is strong and the rocks may be slippery. The coursing creek continues to accompany this portion of the trail. Shortly after passing the falls and the first back-country campsites you’ll encounter an interesting suspension bridge that crosses it. The only unpleasant factor on this trail was the huckleberry bushes; they were many and accompanied us a large portion of the 4-mile journey. That time of year they were calf to knee height though later in the summer they can reach chest to head height. This causes an especially sensitive situation as the berries are a favorite for Grizzly bears in late summer. There are several places where the trail encounters blind corners and hills so be sure to follow standard safety guidelines when hiking in bear country: never hike alone, don’t hike around dusk or dawn, carry bear spray and make plenty of noise (one of our favorite methods is singing and hand clapping–this also helps to alleviate trail fatigue). Also, be aware, the water rushing in the nearby creek may mask your sounds and could increase the likelihood of surprising one of the large Ursines. We did not see a bear on our hike (have you noticed a trend in our hikes in bear country?) though we saw evidence of a very recent pass through. Another hazard of the thick bushes was they almost completely obscured the trail in some cases making it somewhat hard to follow. They also hid a less menacing annoyance, bees–as I unfortunately found out when one flew inside my hiking boot and stung me for my intrusion. We encountered another first on this trail…a wolverine (it looked nothing like Hugh Jackman! ) We were traversing one of the clearer portions of the trail, I was in the lead. As I looked down the trail a wolverine came trotting towards us around a bend about 25 feet down the trail. We all stopped…he looked at us…we looked at him…he looked especially cranky as he panted in the heat…then he kept coming! We’ve never encountered a wolverine in the wild before but I’ve heard stories of their nastiness (apparently they’ve been known to kill moose that have gotten mired in snow drifts as well as a polar bear on at least one occasion–seriously!) At this point I was scanning the huckleberry-covered hillside for an escape route as I did NOT want to have to deal with this critter that is 1/10th my size but has the ability to kill creatures many times larger than me! Fortunately, at about that moment he decided it was too hot for a confrontation and sprinted off into the bushes. We did reach our 4 mile goal but did not make it to Florence Falls. We had the energy to continue on but knew it would have added over a mile to our trek and we had a hefty climb on the return trip. We were also running low on water so we again made the safe choice to turn back–this turned out to be wise as our water barely held out the remainder of the trip. Having faced our fears and successfully trekked 8 full miles in the middle of Grizzly country, we counted this hike as a success! The closest we got (and that I ever want to get) to a grizzly. I kid you not, it looked like something that came from an animal the size of a horse! This is the view from one of the lookout points on the trail. Moose are frequently seen in this area (none were there the day we hiked). Jackson Glacier is just out of sight on the other side of this mountain.